A series of small explosions shook a chemical plant northeast of Houston on Thursday and more blasts were expected, after floodwaters shut down the cooling systems that kept the chemicals stable. It was one of a host of new dangers emerging in the aftermath of Harvey, once a Category 4 hurricane, as floodwaters receded in many Houston neighborhoods and the storm moved through northeastern Louisiana and into Mississippi. In a region dotted with chemical factories, oil refineries, natural gas plants, and other potential sources of combustion and toxins, the explosions at the Arkema plant near Crosby, Tex., underscore the worries that many people have about the lingering dangers that damage from the storm, which was downgraded to a tropical depression on Wednesday night, poses to the region’s infrastructure, economy and health. It appeared that the health and safety risk from the plant was limited; Houston Methodist San Jacinto hospital in Baytown treated 21 first responders for chemical exposure, decontaminating them and then discharging them. The area within 1.5 miles of the plant was evacuated, but it is sparsely populated. The plant produces chemicals called organic peroxides, and Rich Rennard, an Arkema executive, said that smoke from the blasts was “noxious,” an irritant to the lungs, eyes and possibly skin, but he would not say whether it could be called toxic. A total of eight containers at the plant lost refrigeration and can be expected to detonate as the chemicals in them decompose, officials said, but they could not predict how soon others would explode. In Beaumont, about 70 miles east-northeast of Houston, flooding shut down the system that supplies running water to the entire city on Thursday, prompting a hospital to evacuate. With most roads in and out of the area under water, and the Neches River still rising, federal officials are trying to get enough bottled water into Beaumont to prevent a health crisis. In Houston, officials ordered mandatory evacuation of areas around the Barker Reservoir, as flooding from that overwhelmed basin, and the nearby Addicks Reservoir, continued to pour into neighborhoods on the city’s western edge. In other parts of the city, floodwaters receded, exposing countless losses and new hazards, like ruined and abandoned vehicles blocking roads, damaged electrical systems, and mold. Local officials said there were at least 38 deaths in Texas so far that were related or suspected to be related to the storm. Officials throughout southeast Texas said they were prepared for that number to inch higher as floodwaters began to recede. Vice President Mike Pence and other cabinet officials were visiting the Corpus Christi, Tex., area on Thursday to meet with storm survivors. President Trump plans to donate $1 million of his own money to help storm victims in Texas and Louisiana, the White House press secretary, Sarah Huckabee Sanders, said on Thursday afternoon. 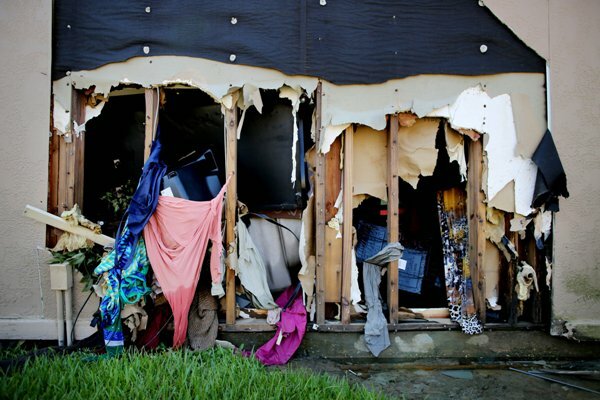 Tom Bossert, the White House official spearheading the administration’s response to the storm, on Thursday estimated that 100,000 houses in Texas and Louisiana have been damaged or destroyed — and said Mr. Trump will seek billions in aid in the coming weeks. More than 30,000 people remained in shelters in the region, and Houston fire officials said they would begin the painstaking search of homes in the city to make sure no one was left behind. The process could take up to two weeks. “The shelter mission is the biggest battle that we have right now,” said Brock Long, the administrator of the Federal Emergency Management Agency. FEMA also reported that 95,745 people in Texas have been approved for emergency assistance, which includes financial help with rent, repairs and lost property. The agency has so far disbursed about $57 million to citizens in Texas. The police in Houston rescued 18 people overnight, Mayor Sylvester Turner said on Twitter on Thursday morning. The mayor also said there had been no arrests or citations for breaking the city’s curfew for the second night in a row. What went wrong at the chemical plant? The plant’s owner, Arkema, said the site had been without power since Sunday and the water was six feet deep in some areas. But the organic peroxides stored there need to be refrigerated or they become unstable. With a storage warehouse warming up, the crew transferred the chemicals to diesel-powered refrigerated trailers. Then the backup generators designed to keep refrigeration units operating were flooded as well. The units apparently warmed to the point where the chemicals exploded overnight. The chemicals, which are used in making plastic and other materials, start to decompose as they warm, which creates more heat and can quickly lead to a rapid, explosive reaction. Some organic peroxides also produce flammable vapors as they decompose. Mr. Rennard said that Arkema employees had no plans to enter the site until the water had significantly receded, given the instability of the chemicals there. The blasts were not expected to affect chemicals in other parts of the plant, he said, and the company was able to monitor the status of the containers remotely. “We’re not going to put anyone in harm’s way to try to restore refrigeration,” he said. Vice President Mike Pence and several cabinet officials arrived to a sunny, hot and humid Corpus Christi, Tex., around midday on Thursday before heading to nearby Rockport to speak with victims of the storm. About 21,000 federal workers have been mobilized in response to the storm and Congress is expected to debate passage of a multibillion-dollar emergency aid package in the coming weeks. Mr. Pence said that he had spoken with Mr. Trump by phone from Air Force Two earlier in the day and asked if he had any words for survivors of the storm. “He just said ‘Just tell them we love Texas,’” Mr. Pence said. Mr. Trump, who visited the area earlier in the week, is expected to return to Texas on Saturday. Mr. Pence was joined in Texas by the secretaries of homeland security, energy, transportation, veterans affairs and labor. Beaumont is running out of water, and a hospital is evacuating. With a record-breaking flood sweeping through Beaumont, taps there ran dry Thursday morning, and officials there said they could not predict when homes and businesses in the city of almost 120,000 residents would have running water again. The city manager, Kyle Hayes, said at a midday news conference that he would not be able to assess flood damage to the city’s water pumps, or give a timeline for fixing them, until water began to recede, which he said would happen no earlier than Saturday. He added that the city was working on setting up bottled water distribution centers. Lack of drinking water poses a survival risk for people trapped in the city, and Mr. Long, in his morning update, said that it was of particular concern to FEMA, which would look to distribute water. But Harvey dropped 47 inches of rain in the Beaumont-Port Arthur area, and most roads into the cities remain impassable, making relief shipments of bottled water difficult. Executives at Baptist Beaumont Hospital decided to evacuate because of the water shutdown. The hospital began to transport most of its 193 patients by ambulance and helicopter to hospitals outside the city, and to discharge those who could safely go home, said Mary Poole, a hospital spokeswoman. Christus Southeast Texas-St. Elizabeth Hospital in Beaumont decided not to evacuate, but until the city water supply resumes, it will only admit new patients who need critical or emergency care. The hospital, which has 256 patients, told nonessential employees not to report for work. Beaumont’s water comes from two pumping plants, a primary one on the Neches River, and a secondary one drawing from wells north of the city, Mr. Hayes said. But both were inundated, and by Thursday morning, the pumps were out of action. The Beaumont Police Department posted pictures of the flooded main pumping station on its Facebook account. City officials made it clear that Beaumont was in the early stages of dealing with the flooding, and did not provide details of the number of dead, or how many people had been rescued or were in shelters. Our reporter Rick Rojas is in Beaumont, his hometown. Read more about his journey home here. ‘So much despair,’ one evacuee says. At the George R. Brown Convention Center, Houston’s main shelter, evacuees have been learning of deaths from social media and from watching news reports on an enormous projection screen. Mr. Cartwright, 44, said he believed he had lost all of his possessions to the flood. “I try to think that when all of this passes, just like any other tragedy, America always bounces back,” he said. The flooding threat has not passed. The rain continued across the far eastern part of Texas and the western part of Louisiana on Thursday, according to the National Weather Service, even as the storm lost power as it moved northeast. Flash flood warnings were in effect in East Texas, the lower Mississippi Valley and in the western parts of the Tennessee and Ohio Valleys, where the storm was expected to spread over the next several days. Some rivers in southeastern Texas remained at record levels Thursday — some were still rising and setting more records — as the deluge made its way downstream, and swollen reservoirs released some water into streams. Near the Louisiana border, the Neches River at Beaumont rose on Thursday to more than five feet above its previous record — more than 14 feet above flood stage — and it was projected to keep rising through Friday. Beaumont has received about 47.35 inches of rain since the storm first arrived. At two flood gauges in the suburbs west of Houston, the Buffalo Bayou remained two to three feet above the old record for the fourth straight day, nine to 11 feet above flood stage, and it was not expected to drop for several days. Southwest of Houston, the Brazos River at Richmond broke its flooding record on Thursday, reaching 10 feet above flood stage, and was not expected to crest until Friday. A Houston school district delays reopening as Austin offers help. After initially saying schools would open on Tuesday, Sept. 5, the Houston Independent School District announced Thursday that classes would not resume until Monday, Sept. 11. Superintendent Richard Carranza said more than 10 percent of the city’s schools sustained water damage or had lost power. Families have reported that they lost hundreds of dollars’ worth of new school supplies and clothing in the storm. The district also announced, via Twitter, that uniform rules would be relaxed through January. Houston public school students will have access to three free meals per day, regardless of family income, for the duration of the 2017-2018 school year. Also on Thursday, officials in Austin announced plans to open their classrooms to potentially hundreds of displaced students whose families have fled there to move in with relatives or seek refuge in shelters. School officials have been circulating through shelters to advise families from storm-battered southeast Texas that their children will be able to enroll in Austin schools as early as this week, said Paul Cruz, superintendent of the Austin Independent School District. At least 100 students staying in the shelters have signaled their interest in attending. The students are also being invited to attend any of the district’s Friday night football games, he said. Port Aransas is trying to get back on its feet. When 120 m.p.h. winds lashed this beach town where Hurricane Harvey made landfall, they smashed some things and spared others. Houses were pushed off their foundations, while shacks next door were spared. Big trees stood as small trees toppled. At Spanky’s Liquor on the main street, the windows shattered, the walls collapsed. “The roof? It’s about 100 feet that way,” the owner, Tom Hamilton, said as he paused from sweeping the pieces and pointed toward a house with a boat capsized against the porch and a surfboard lodged in a tree. But miraculously, nearly every bottle of liquor was still intact on the shelves, now standing under an open sky. On Wednesday — the first full day Mr. Hamilton had been allowed back to his store — a crew of employees packed boxes of bottles in the sun. Like many on the island, Mr. Hamilton and his staff were beginning the long, often quiet ordeal of loss and recovery. Christy Lambert pulled out her phone to find a photo of her home in Aransas Pass, just across the bay. There was nothing left but a single kitchen wall. Most of her possessions had blown away. “When I saw it, I cried, I cried for hours,” said Ms. Lambert, who fled the storm and returned Monday. Legal aid lawyers are preparing for more cases. Lawyers for the poor in Texas are expecting more cases in the wake of the storm, on matters including the denial of disaster relief claims by FEMA and landlord-tenant disputes. David Hall, executive director of Texas RioGrande Legal Aid, said his office, which is based in Austin, expects to handle an additional 15,000 client matters this year, on top of the 20,000 to 25,000 client cases it usually opens each year, and to field a 1,000 calls a day related to damage.